Clients currently use the custom table features to address attendance, absence, performance, entitlement, commission and review type functions. Edit utilities allow users to customise views of the Masterfile to facilitate speedy adjustments to data fields. Throughout Quantum Payroll there are features to assist users update essential fields with accuracy yet with minimum fuss. Quantum Payroll offers a direct paypath facility whereby employee’s net pay is sent directly to their personal Bank accounts. A split net pay capability is also available, this means that net pay can be divided up and posted into multiple bank accounts. This would facilitate Court orders or where Attachment of Earnings certificates have been served. Other obvious functions would be to facilitate savings schemes whereby the employee would dispatch amounts to a deposit account and manage the scheme themselves. Amounts can be set as a percentage or defined as specific values. In addition, voluntary deductions may be paid on a period by period basis or on a monthly basis directly into a nominated bank account via a paypath file. This is beneficial to companies who would otherwise have to go through the cheque requisition process in order to pay VHI, Union, Savings schemes etc. Integration is a fundamental requirement and established access points within Quantum Payroll allow users maximum flexibility, Quantum Payroll can be linked to a wide variety of systems, as can be seen from the flow chart, integration is often required for Personnel Systems, Time & Attendance Systems and Accounting Systems. Quantum Payroll has standard import routines for these functions. 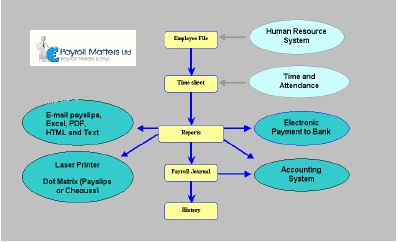 Using a query utility, the system can generate a user defined output file therefore allowing synchronisation to other databases Should you have the Nominal module a Payroll journal can be created within Quantum Payroll. This file can be exported in either a CSV or flat ASCII integration file format. Quantum Payroll has integrated with many Financial systems including, Sun Accounts, Pegasus, SAP R/3, Agresso, Open Accounts, Sage financials, Exchequer etc. Other standard interfaces exist such as links to Cashless Canteen Systems for weekly deductions and various different time & attendance systems for hours worked. Indeed a standard timesheet import file allows hours, values and rates etc. to be imported directly to the timesheet. A standard import routine is also available to accept files from the Revenue for tax credits and cut off details (P2C) along with routines for P45’s, P45 part 3, P46 and P35 uplift. For direct integration an option has been made available to link directly to the database structure within Quantum Payroll. A module called Quantum Payroll I/O (Input/Output Module) allows third parties to seamlessly integrate with routines to link databases. Quantum Payroll provides for multiple pay frequencies – Weekly, Fortnightly, Bi Monthly, 4 Weekly, Monthly, Quarterly, Half Yearly or Annual. Where an employee is to move from Weekly to Monthly for example, then the system can effect such a change with the minimum of fuss. Quantum Payroll offers a detailed 2 tier costing structure, which allows you to cost employees over a range of different cost areas. The system comes complete with a detailed set of costing reports that enable you to analyse costs right down to employee level. These reports may be tailored to suit each individual client’s requirements or alternatively may be analysed directly by Microsoft Excel. Job Costing is obviously an important factor in controlling costs and with Quantum Payroll, you can cost hourly paid employees within a payroll period to multiple costing areas. All elements of cost will be proportionately applied to where the hours were worked. This is a useful feature for costing by project, product line, contract etc. Employee costing information can be either input directly by the operator or can be imported directly from a time & attendance system, time & billing system, project management system etc. In addition to this salaried employee’s may be apportioned on a percentage basis over a variety of different costing areas e.g. your administration/finance costs may be apportioned over all of the company’s cost areas. Quantum Payroll has an in-built report writer whereby users can easily and quickly design their own specific reports. These reports can be saved and loaded at a later date, run time parameters can be set to give users period ranges and other variants such as employee, department and cost centre ranges. The user has full control on the report presentation, layout, fonts etc. All reports have the capability of being exported to Excel or PDF. 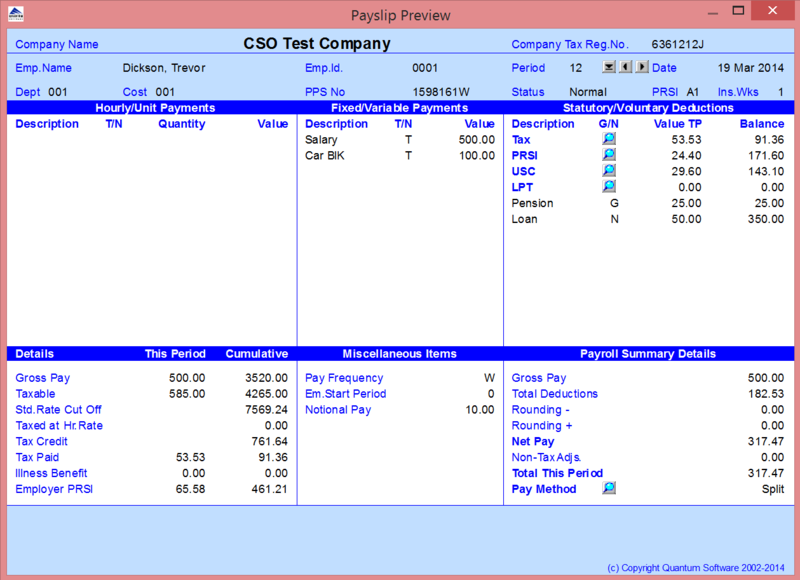 Quantum Payroll has a large number of standard reports available to users with comprehensive print options. In addition options are readily available for any historical report to be re-issued that is viewed, printed, dispatched via email (PDF) or downloaded to MS Excel. 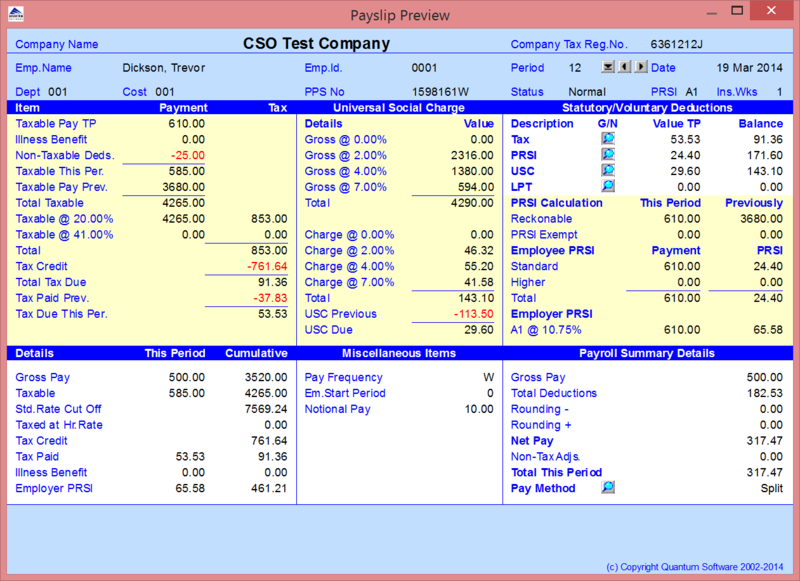 Within Quantum Payroll, there is a detailed payslip history available which can be viewed through the timesheet. This has a few distinct advantages. 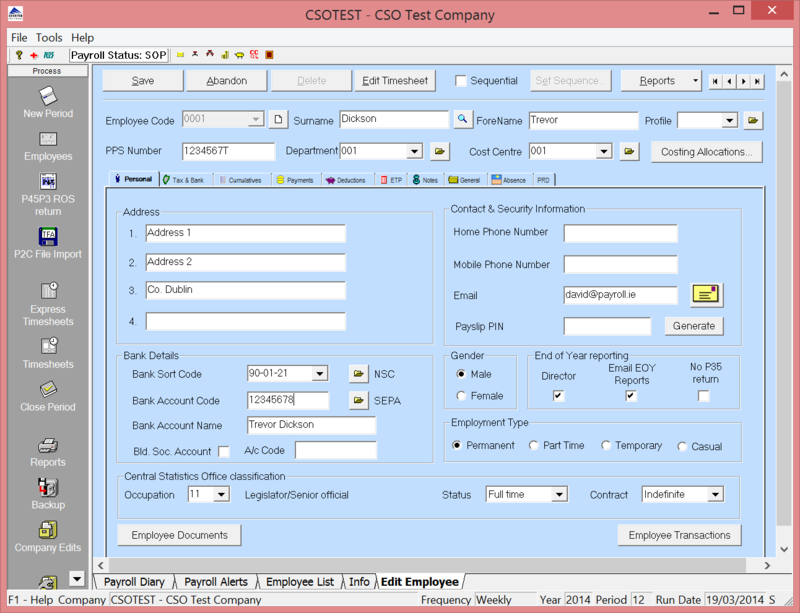 Firstly the user can access a payslip, for any employee, for any period on screen. This means that old payslip files do not have to be drawn from storage. Likewise it’s useful for generating copy payslips if needed, but it is also useful when comparing this week with last week. Comparisons like this highlight dramatic changes in pay. When viewing the current payslip a breakdown of the PAYE, PRSI, USC & LPT calculation are available to view and can be printed should an employee wish to see how the calculation was made. Quantum Payroll provides a large range of payslip stationery that are compatible with laser, ink-jet and dot matrix printers. Pre-sealed security payslips, dual copy payslips and external postage quality payslips are all available ex-stock. Should you wish to issue your employee’s with electronic payslips, then Quantum Payroll features the ability to generate and output payslips to email. Employees receive their payslip as a printable image (Adobe PDF) which can have PIN access codes. (MAPI and SMTP) Options are readily available for any historical payslip or indeed report, to be re-issued and dispatched via email. 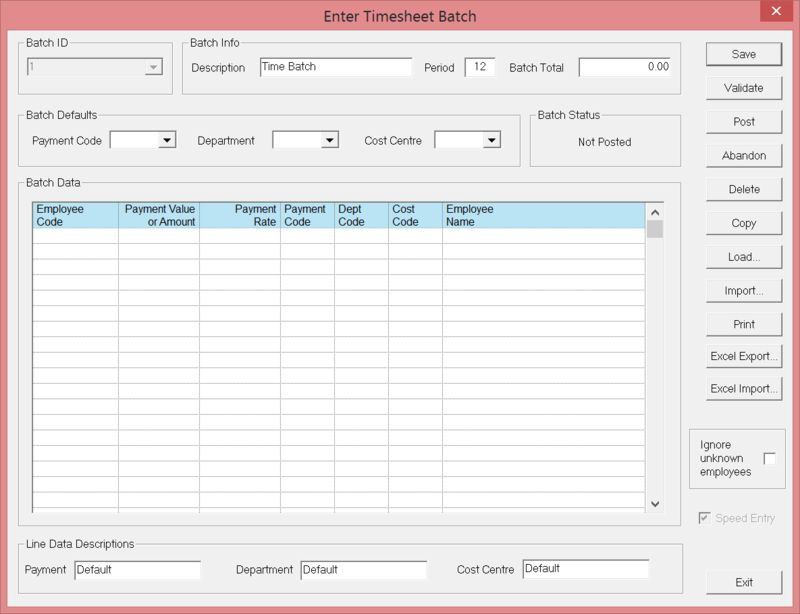 There are 3 types of timesheets available to the user. 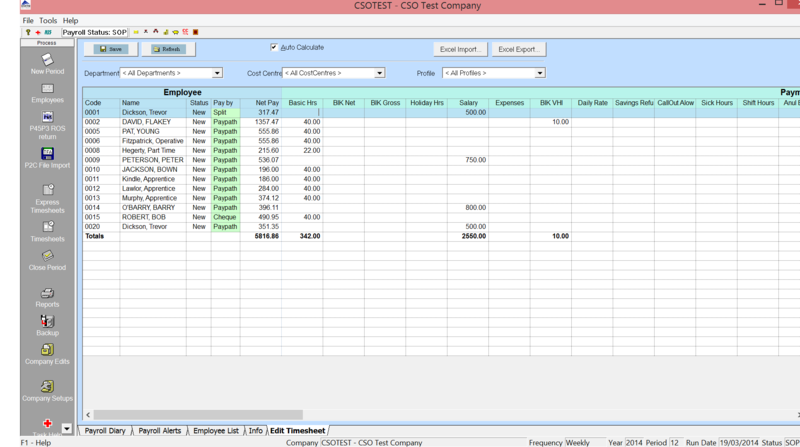 (a) Standard type timesheets are where all timesheet details are entered individually per employee record. The timesheets can be entered in as sequential access or random access. Sequential access has many options and sub options which allow the user to call up any entry sequence that they desire. All pay and deduction types are available to view and edit, therefore any parameters can be entered. In addition when used in conjunction with the Job-costing module, employees can be charged to multiple departments \cost centres \ payment recorded items. (b) Express timesheet is where departments, cost centre groups or the entire payroll can be viewed in a spreadsheet format to allow easy entry of data. Timesheet date can be either be directly entered, or imported or exported using this option. In addition (single department\cost centrer) timesheets that can be converted into either Excel/CSV format from Time & Attendance and Clock card systems can also be imported into Quantum.. The timesheets can also be exported to Excel, edited and re-imported if required (allowing for a single type of pay item to be uploaded, e.g. Expenses). Within the timesheet, the proposed payslip to be issued can be viewed. 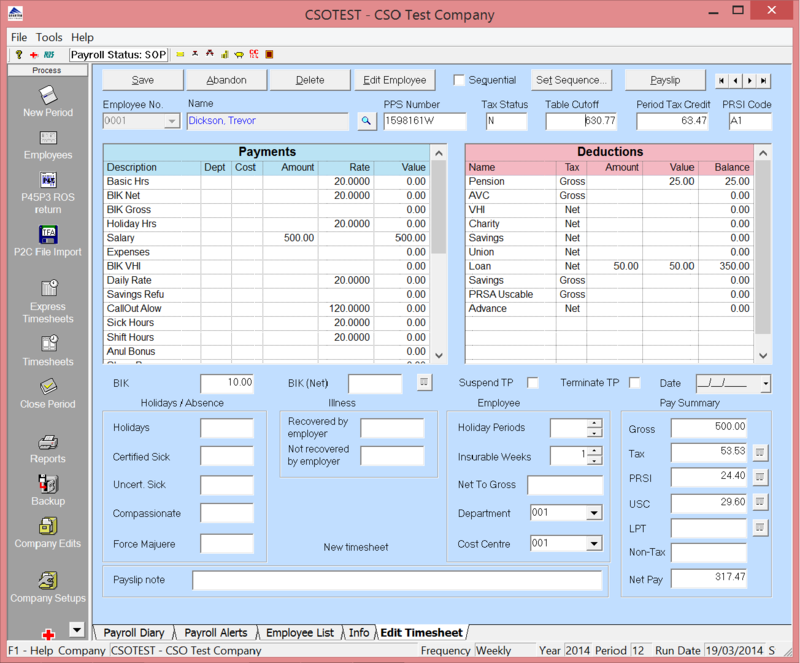 All previous periods’ payslips can also be viewed within the timesheet, this allows users compare previous payslips at a time when comparisons are of value. .
(c) Batch Timesheet is where a time and attendance link is set-up to allow for a file to be imported into the payroll from a time and attendance system. The timesheet details can be based on a single department & cost center per employee, or else (when used in conjunction with the Job Costing Module) a multiple number of departments and cost centres.